ShinHan Artists Watercolour is manufactured with the simple concept of creating the finest paint possible, using the best organic and mineral pigments that the world has to offer. 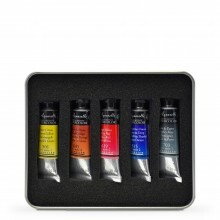 Artists Watercolour is also crafted with the finest high-grade gum Arabic. To enhance the clarity and depth of colour, single-pigments are used whenever possible and the usage of mixed pigments has been limited. Based on the Munsell system, Natural Colour System (NCS) and the Ostwald System, these 84 colours are sophisticated and highly regarded for their permanence. The use of single-pigments means that the watercolours are less prone to fading and the consistency of colours are improved. The ShinHan palette offers colours that are transparent and subtle, yet intense and vibrant, allowing for an even greater freedom of expression. Made with the help of optical science guarantees that they maintain excellent brightness with the best refractivity. ShinHan water colours are AP health labelled and comply fully with the ASTM-4236 standards. They are highly recommended and are very competitively priced. 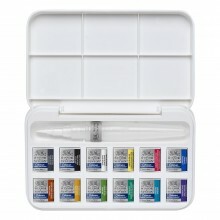 ShinHan Artists Watercolours are ideal for spread techniques and colour overlapping, bringing out the best in watercolour paper.